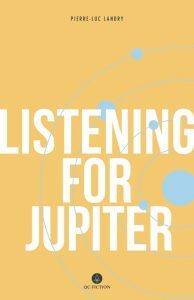 If you’ve been looking for a novel that explores the underpinnings of reality, the material of dreams, and the almost-mystical revelations we sometimes have while just living our lives, then you need to get yourself a copy of Listening For Jupiter. As a work of magical realism, Landry’s novel is especially intriguing for its multiple and overlapping plot-lines- an existentialist Venn diagram, if you will, in which each of the main characters has his own chapters; and then the two characters meet in other chapters, but only in their dreams. The title itself captures the cosmic surrealism that imbues this story: both Xavier and Hollywood keep running across tv documentaries about Jupiter, and learn about its ongoing storms and how one can listen in on the planet just by using a radio. They each see the planet glowing in the night sky, surrounded by its four moons like subjects paying court to a queen, after which they fall into strange dream-states. Back on Earth, however, Xavier and Hollywood have each reached a turning point: neither one understands anymore how to live like other people and be happy/content with existence. Each constantly questions what is real and what is illusion, especially when they find that they keep bumping into one another in a recurring dream. The dream itself is about escape: they find an empty beach house in Montauk (actually, Montauk seems entirely deserted) and a wad of cash. Thus Xavier can, for a time, escape his life as a pharmaceuticals salesman, and Hollywood can find purpose after having his heart replaced by a machine following experimental surgery (you read that right). It’s puzzle pieces like that one (you can’t actually live without a heart) that fit together in Listening for Jupiter to create a picture of disillusionment and surreality. At one point, Xavier writes in his journal, “Feeling alienated from the rest of the world. Also, a need to examine the existence I keep doubting” (48). Add to this the meteor showers that invade their shared dream, the strange and unexplained excessively-long winter that has spread halfway across the world, and the fact that people can keep track of other people through unclear methods. As Landry explains in his afterword to the novel, Listening For Jupiter offered him a way to examine themes of “existence, strangeness, how each of us experiences reality and the world around us” (215). As a high-school student taking a Philosophy class, I was absolutely fascinated by such brain-twisting questions as “how do I know if anything outside of myself really exists?” If I leave a room and enter a different one, does the first still occupy a place in reality? Of course, in order to live our lives in the way most people normally do, we accept that much of what exists in this world of ours is not accessible to our senses at all times. Also fascinating was the question, “what if the entire world I experience is just a dream and everyone else is a figment of my imagination?” Dwelling on those issues too much would probably be unhealthy, but I like turning them around in my brain now and then. It was exciting to read a book that explicitly took up these questions and toyed with one of the great ones in all of philosophy: how do we know what’s real: our dreams or our waking lives? So while Listening For Jupiter takes on some of our greatest philosophical conundrums, it does stop short of exploring them in as much depth as I would have liked. This novel could have been much longer, richer in detail, and ambitious in scope. Nonetheless, Landry’s deft handling of a story that veers back and forth between dream and reality, and the interesting questions he raises, made this novel an enjoyable read. The fact that each of the two main characters got their own translator adds to the unusual nature of the story itself. In this way, Xavier (translated by Arielle Aaronson) and Hollywood’s (translated by Madeleine Stratford) voices could remain distinct literally and figuratively, even as they were crossing over from French into English. I look forward to reading more by Landry and whatever QC Fiction brings out next.